A penny-roller card (also called a slider card) adds fun to your handmade greetings and can be adapted to many occasions. I chose a Christmas theme this time. Find out how to make one right here on this page. NOTE: You can also adapt this card to suit many other happy occasions. Scroll down to see instructions and suggestions for changes, but maybe go find two small coins first, such as two five cent pieces or two thin dimes.Very thin, light slugs could also work. The coins or slugs will be essentials for your spinning mechanism. Aren't the gingerbread men cute? 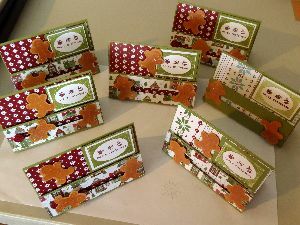 They were made with a matching stamp set and set of Framelets dies from Stampin' Up! (now sadly retired). It made them look like sugared cookies to me. Then I set them aside to make the rest of the card. Make a card base from half a piece of A4 cardstock. I chose Lucky Limeade (retired) for mine. Work with it in landscape orientation. Cover the front of your card with a piece of designer series paper. Cut a piece of cardstock at 5cm x 15cm and cover it in designer series paper (dp). Use a liquid glue like Tombow Multi or the FIne Tipped Glue Pen to make sure the dp is adhered well to the cardstock. Turn the 5cm x 15cm piece over and draw a pencil line down the centre, lengthwise. 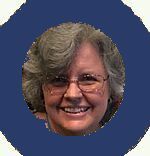 Cut a slot as wide as a Stampin' Dimensional along your piece, but leave the ends uncut. Adhere two coins together with a double stack of round dimensional foam (I used Stampin' Dimensionals with the hexagonal corners nipped off). Slide the double stacked coins into the slot and check to see that they roll freely up and down it when the piece is tilted from side to side. You can powder the sticky edges with your embossing Buddy to take away some tackiness if needed. Adhere the slotted piece to the front of your card with double-stacked Dimensionals, avoiding the slot. Adhere your best gingerbread man to the coins and tilt your card to see if he spins across it. If he doesn't, check for any obstacles along the slot. 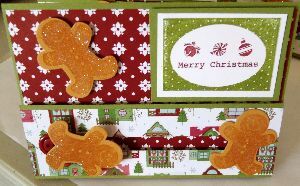 Finish your card with more gingerbread men, a button and a sentiment. You may also like to make another form of spinning element card, a Suspension Spinner Card. 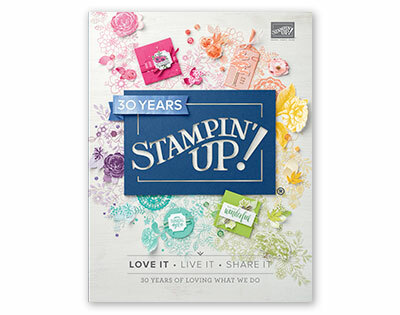 You can also purchase Big Shot dies from Stampin' Up! that will allow you to cut out slider card bases with ease. See what is available in the current catalogue featured in the left hand column on this page. I just love elements that move on a card. They add a lot of fun for the receiver, don't you think?